They don't know why, but scientists say some adolescent stars rebel against the norm by spinning more slowly than their peers. Normally, a young star gets smaller as its gravity pulls gas and dust in toward its center; the smaller the star gets, the faster it spins. But a scientist with NASA's Jet Propulsion Laboratory, Pasadena, Calif., and her colleagues have found that a significant percentage of adolescent stars do not spin faster as they shrink. "A young, shrinking star should behave like a skater who pulls in her arms to make herself smaller and spin faster," said Dr. Luisa Rebull, a staff scientist at JPL and the California Institute of Technology in Pasadena, which manages JPL for NASA. "We don't know why some stars act differently, but we'd sure like to find out." 1 -- It is simply a quirk of the process by which the stars formed. 2 -- The stellar winds are carrying away the angular momentum, or spin. This is like a skater who extends her arms away from her body to slow down. 3 -- The magnetic field generated by the young stars locks their rotation to the slower rotation rate of the dust and gas disks around them, disks that might eventually form planetary systems. 4 -- The stars have already formed planets from their disks. In our solar system, the largest planet, Jupiter, has the most angular momentum, or spin. Maybe other planetary systems are operating the same way, with large planets "stealing the momentum" from the parent star. The fourth possibility intrigues scientists with NASA's Origins Program, which will hunt for Earthlike planets that might harbor life. If orbiting planets cause this odd stellar behavior, scientists might detect them by looking for this trait. Rebull is a scientist on a new Origins mission, the Space Infrared Telescope Facility. The mission will launch early next year on a mission which, as one of its many goals, will look for planet-forming disks around other stars. A subsequent Origins mission, the Space Interferometry Mission, will look for planets around young stars to investigate the planet hypothesis directly. 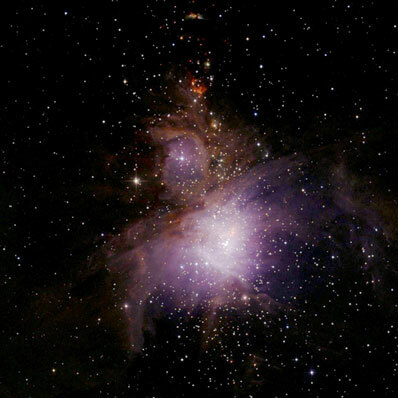 For this current research, Rebull and her team studied more than 9,000 stars in the Orion Nebula and the Christmas Tree Cluster, also known as NGC 2264. They observed about 500 stars with large spots. The spots are like Sunspots, but much bigger, covering a large portion of the star's surface. As the stars rotate, the spots come into and out of view, causing tiny changes in the total light we see from the star. Some of these stars appear redder than expected. That might indicate they have dust disks around them, Rebull said, which could interact with the star to slow its rotation. This might support the third possible explanation. The researchers used the .76-meter (30-inch) telescope at the McDonald Observatory in western Texas. They also incorporated data from the National Optical Astronomy Observatory, Tucson, Ariz. The research paper, which Rebull co-authored with Drs. Sidney Wolff and Steven Strom of the National Optical Astronomy Observatory, and Russell Makidon of the Space Telescope Science Institute, Baltimore, Md., will appear in the July 2002 issue of the Astronomical Journal. JPL manages the Origins Program for NASA's Office of Space Science, Washington, D.C. JPL is a division of the California Institute of Technology.